I find the most value at the conference not at the workshops and how-to sessions, but the more general education related sessions. Day 2 KeyNote by Sherry Turkle, Henry Jenkins and Marina Bers was great. Turkle presented her latest thought on the importance of Solitude. This frankly scares me. She has pointed out with our new constantly connected, constantly fed (with information) environment, would teens (and adults) know now to be alone? Not knowing the value of solitude, when one creates, and engage in deep self development, teens will be increasingly dependent on shallow casual interactions. Their phones become the center of their lives. They move from "I have a feeling; id' like to make a call" to "I want to have a feeling; I need to make a call." Turkle ends with an encouraging note -- Do not use the word "Addiction" when talking about this connected world. Addiction implies that we want to get rid of the cause. We will not and cannot get rid of the Internet. While many people falls into the fallacy that we are stuck with the current state, the Internet is actually very young. We can learn to live with it. Referencing Thoreau, she encourages us to not live thickly - "Just because we have the net we do not have to live thickly". Side Note: A funny moment at the start of her presentation, when Turkle says "you know when I say phone, I don't mean phone". Of course, she meant the smart phone/device that is used for texting, running apps connecting to facebooks, and seldom for realtime phone conversation. Jenkins pointed out that the participatory culture is not new. Facebook is not the first social network. While Jenkin's studies often reference the fan fiction culture, there are many more examples. A "good" participatory community is not a pure consuming community. The "hanging around" group consume content, but also communicate with each other. The "Messing about" group contributes with self-expression and self-actualization. The "Geeking out" group tinkers and create for the community. A participatory community allows experts and beginners share a common interest and help each other. "Not every member must contribute, but all must believe they are free to contribute when ready, and that what they contribute will be appropriately valued." Brian Harvey gave a short presentation on Day 2, and a long one on Day 3 on BYOB, the CMU developed variation of Scratch that has list of lists and "procedures" which turn Scratch into almost visual Scheme. Given these new first order data object, one can program much more advance concepts using BYOB. Technically BYOB is brilliant and I can't wait to use it. Politically they are working hard with the core Scratch team to find a way to incorporate BYOB into Scratch. Harvey is extremely sensitive to no wanting to split the Scratch community into the beginners and the advanced users. I hope they find a way to do this as BYOB clearly is a good thing. It happened. Once they discovered the drawing tool for sprite, they are all over drawing. "The Art Thing" the three year old calls it. She doodle some lines, and then want to make it move. I showed her once or twice that she needs the "flag" orange block and the "loop block" first, then stuff it with some motion blocks. The only thing that she has to remember to add is the "bounce if edge" block. After only a few tries she can assemble a basic "repeat forever, move, turn, move" type of scripts herself for all her sprites. One interesting thing is that she wants to keep adding sprites, so now her program has some fifteen sprites on it, all dancing around the stage. I asked her to draw more complicated sprites and use less of them, but she won't have it. She like to keep creating new ones, and the messy screen is appealing to her. For some reason, the four year old is less interested in the whole thing. I have a video of her "programming" that I'll have to upload soon. 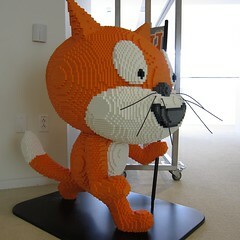 Scratch is a programing language and environment designed by the MediaLab for used by young children. It is best described as a tool for making programmable media. It is used not just for programming as you know it, but for making games, telling stories, making dynamic artwork. Education and Computer is an interest of mine. I have been watching Scratch grow for the last two years. This is their very first conference. How was it and what did I learn from the conference? It was attended by educators and researchers from all over the world. There were interests in, obviously, using Scratch to teach math and science concepts. But Scratch is also uniquely suitable for generating other programmable media -- arts, story telling, and music. One of the main theme is to use it to enhance learning in all subjects. Lots of teachers are looking for help, ideas, lesson plans, and examples for using Scratch in the classroom. There are several notable use of Scratch in high need, under served communities to get kids, especially girls, interested in learning. The Compugirls program for example, using the idea that these programs need not only to be gender relevant, but cultural relevant. The CompuGirls program ask the girls to create project that has a social justice theme relevant to their own communities. The presentation was given by two of the CompuGirls and they were most impressive. The presented a project that explains, and call for action, on the effect of gentrification on the school system. On the other end of the age group, Harvard uses Scratch on their first week of undergrad Computer Science CS50 class. Using something accessible like Scratch helps them retain more students during their shopping / audition period. They also confirmed that Scratch is too simple and limited to be used in more than the first week of their class, for computer science students. While there are negative feedback from students who are already knowledgeable in programming, some of them also pointed out that while it is not useful for them personally, it was useful for "the others". It also offers an opportunity for them to "show off". Deep Thinking at Grade Level Another use of Scratch was presented by an elementary school at the Portola Valley School District. This is an affluent school and they use Scratch to let high achievers explore deeper within their own grade level, instead of the traditionally "pushing them into higher grade" approach. This approach let the student develop "deep thinking at their grade level". Colleen Lewis from UC Berkeley presented some perhaps not obvious problem when introducing Scratch programming to 7th and 8th graders. Some of the "obvious" concepts to us may not be obvious to a child. For example, the concept of turning -- i.e. changing direction in place, is not obvious. In the real work, turning usually includes forward movement. Turning left in a car goes forward and left. Even the simple idea of sequencing, each Scratch block is executed in sequence, is also not obvious. Since it is hard to demonstrate and learn that concept using sprite movement, she suggested one should use sound output first to demostrate sequencing. Another big area of problem is how to teach the children to plan before doing, and to debug their program when there are problems. Many other teachers contributed their solutions to this very common problem. Funny because this problem exists in the "real world" as well for professional programmers. One of the key take away for me is the importance of "storyboarding" as a planning tool/step. The Scratch Website and Social Networking This was one of the surprises for me at the conference. 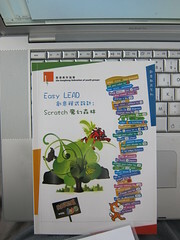 Most Scratch users will be already familiar with the website. But I wasn't. When Mitch Resnick and Andres Monroy Hernandez (the person responsible for the website) presented what has been happening on the Scratch website since it's launch, I see an immediate parallel with the main stream social networking sites. These are wonderful ideas that we see in different social networks today. During a session specifically on the website, many people asked Andres why he seems to be pushing the feature set in his own direction and not borrow many things from the common social networking sites, and sites like Amazon which has a strong social component to it. Initially I thought the same. After listening to the discussions I concluded that the Scratch team is right. The purpose of the Scratch website is not to create a general social network, although the user base benefits from some level of networking. The main purposes of the Scratch site(s) is for sharing project, teaching and helping each other to use Scratch. For those purposes, they are developing better ways to search and group projects, and to develop more ways to decentralize content control. The Scratch project were initially developed and tested for the Computer Club House projects, an after school club house to engage children in use of technology. These club houses provide students access to many different computing media, not just Scratch. The club houses are staffed sometimes by short term volunteers, and sometimes by longer term volunteers. The sessions on the Computer Club House was not as much about Scratch as the dynamics of the club house environment. The club house wants to move from "community Technology center", where typical instructions are on basic computer skills like typing and word processing, to facilitating creative design. As expected, it was not easy to motivate the children to start getting involve with the computing activities. To get the kids away from gaming, they developed an informal system of "club bucks". For working on design projects, the kids will earn "club bucks" that they can use to buy gaming time. The closing keynotes of the event was a two part keynotes, first by Geetha Narayana and then by John Maeda, on "Learning to Design", "Designing to Learn" . Geetha is of course as inspiration as ever, talking about her projects at the Srishti School of Art, Design and Technology in India. She gave a beautiful and inspirational presentation, looking at the problems with the under served children in India and how to help them. The title, "Creating new Leonardos and Developing Urban Arcadias" sums it up very well. One of her keyword is "Slowness" -- a simple word that has deep meaning in this context. John Maeda recently left MIT Media Lab to become the president of RISD. His presentation is funny and punchy as always. He threw hundreds of ideas and questions at us with very little answers, provoking much thinking. Taking in all I have learnt from other educators, I first introduce the Scratch environment simply by showing them the program. Since (unfortunately) both are familiar with games, they immediate ask whether it is a game and what game can they play. I redirected that by telling them that these building blocks like Legos that they can use to build things. I prep the workspace with several sound blocks, and the start block. I have to explain that since there is a green flag on the start block, it means if you build the blocks under the green flag, then press the green flag, you can see what you have made. The Lego analogy works and the four year old very soon refer to his creation as a "tower". That held his interest for a little while but he keeps asking for what games can I do. We switched to the sprite drawing tool, since he loves to draw. He drew a car. So I decided to intervene and put in a little script to make the car move across the screen. Then I ask him to draw more cars and we ended up with a simple "racing game". Pressing the green flag and the cars glide across the screen with a randomized time, "racing". That little game held his interest for about 10 minutes. Then he is distracted and went to do something else. I then added a sound sensing feature so that when you shout "go" (or anything) the race starts. Both kids got interested and played with it for a few more minutes then left. Lessons learn: Lego analogy works fine. Still searching for a way to get them interested.